On Saturday we headed out of town to check out the Arizona Renaissance Festival. It was pretty hot walking in from the huge, dusty parking lot so we stopped in the shade for some lunch. This lovely lady played the harpsichord while we cooled down and ate some festival fare. She was really quite talented. Mike by the Cthulu ride. The girls took a ride on the flying machine. Then they felt bad because all rides are powered by the people running them with various cranks and mechanical systems. We found a fire breather performing next to an ironic sign. All the buildings seemed very authentic. I particularly liked the tree man at the broomstick shop. The broomstick shop was full of Firebolts and Nimbus 5000's as well as some very practical looking brooms. This is the funeral cart, complete with corpse inside. Naomi and a beastly companion. Naomi and Chloe and I waited in a long line to ride the elephants. They were orphaned and rescued in Botswana and spend 30 weekends a year raising money for their animal sanctuary by giving rides. It was surreal to find myself on the back of one of these incredible creatures! Naomi, showing off her "Mona Lisa "smile. 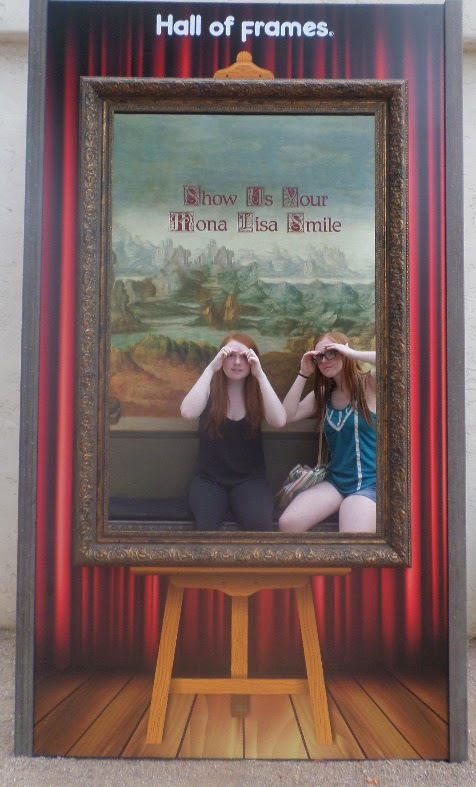 Chloe and Phoebe posed like this because, as everyone knows, the Mona Lisa has no eyebrows. Naomi took on the climbing tower. I've obviously been neglecting my other calling. This is the outside of a fantastical creature shop. I wish now I'd gotten some shots of the creatures inside! Near the end of the day, the girls joined in with some dancing. The man in the hat was a demanding partner and kept all three of them dancing. It says" We moved all your cars - Good Luck" (fortunately they were kidding). This one hangs on the wall and is titled "The Gift"
He is one of many odd birds that will be in my solo exhibit. "Parting is such sweet sorrow that I shall say good night till it be morrow. "